This 1,000 round case of 9mm Makarov ammunition delivers hours of cost-effective shooting for your PM or other pistol. 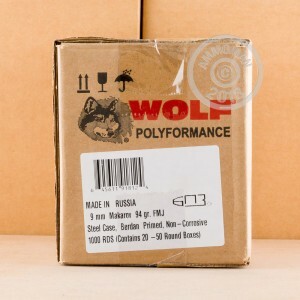 Manufactured in Russia, these Wolf cartridges use bimetal jacketed 94 grain bullets and non-reloadable steel cases with polymer coatings for smooth cycling. 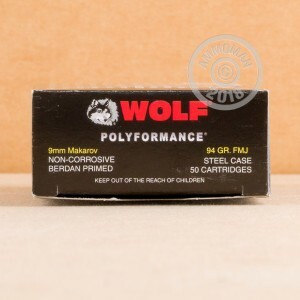 These cartridges have some magnetic properties due to the steel used in their construction, so they may not be suitable for all indoor ranges. AmmoMan.com is committed to charging you only the list price for all orders over $99. That means free shipping for just about every 500 and 1,000 round case like this one! Ordered on a Tuesday night, receive a call Wednesday morning confirming the transaction, shipping, and billing information, received Friday afternoon. The call took roughly a minute and the caller was intelligible and well-mannered. 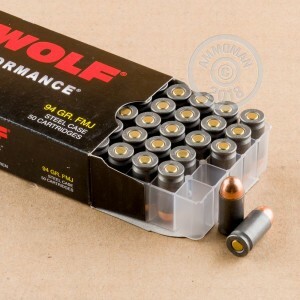 Previous experience with Wolf ammunition tells me these rounds will perform as I expect them to; the boxes of 50 were in proper condition upon arrival.